Thousands of Czech cars ride in the street with an orange square sticker on the rear window. It is a way the taxi drivers and their supporters are showing support to each other. The drivers that do not want to participate in street blockage can also claim allegiance to the protests. Many uninformed drivers could have been surprised seeing that some cars, mostly taxis, have a square orange sticker in the corner of the rear window. It is very probable that most of the drivers already met such a car. There are more than four thousands of cars with orange stickers riding the Czech roads by now. It is not a requirement of any new regulation or a high-visibility element, it is a way the taxi drivers and other people, particularly their family members, join the protests against the drivers of Uber and Taxify drivers. Those are doing their business illegally and do not meet the conditions imposed by law, according to taxi drivers. „We actually started the whole protests with this orange wave. We started to distribute the orange stickers approximately three weeks before we first went out on 8th March to demonstrate at Strahov,” says Karolina Venclova from the Association of license payers in taxi services. 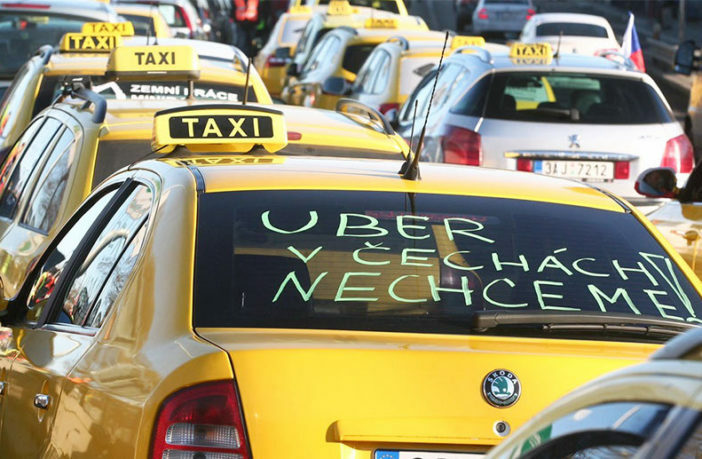 Only in Prague, taxi drivers have dismantled three thousand stickers. However, the cars that have them in the window operate throughout the whole Czech Republic. According to Ms. Vankova, there should be over four and a half thousand of them in Czech. The organizers of the protest chose the orange color to make the labels visible. They say that yellow or white color would disappear on equally colored taxi cars. The stickers are also a way the taxi drivers that don’t want to block the traffic can show their agreement with the colleagues. “The stickers are designed also for those who don’t completely like the way we chose for our protests, but at the same time they also disagree with what Uber is doing here, ”Ms. Venclova confirms. The ordinary drivers will see the stickers for a long time according to her opinion because the taxi drivers do not plan to disrupt the strike alert any time soon. They are currently waiting if the promised memorandum between the government and Uber will be signed – it is supposed to happen by the end of March. If the taxi drivers will not be content with the results, they are ready to get out to the streets again. There is still a small group of taxi drivers who keep demonstrating in front of the Prague City Hall every day for about an hour. Although there are thousands of supporters of the taxi drivers, much more people count themselves among their opponents. At least in Prague where the survey showed that four out of every five inhabitants disagree with the protests.